Just spotted this tangible step sequencer on Synthtopia, I like the way that the webcam is underneath so that it avoids occlusion problems. Nicely done – shame that the webcam isn’t also used to track different colours in the same way as the bubblegum or skittle sequencers though. The project was built using SensoMusic Usine. 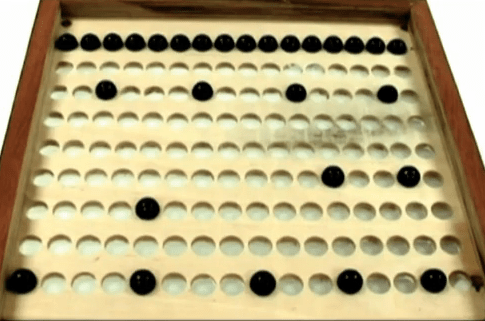 BEARINGS GLOCKEN is a musical instrument that automatically performs a glockenspiel using steel ball for bearings, said to be the world’s most perfect sphere on earth. The steel ball is finished into a nearly perfect sphere, and has the property of uninformly bouncing back, over and over. BEARINGS GLOCKEN uses this property in a musical instrument. 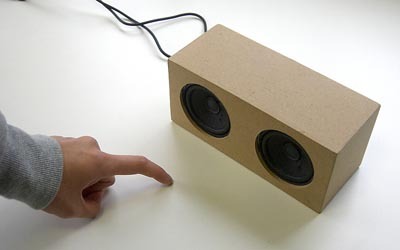 Just spotted the BoxBeat project on the MAKEzine blog. It’s a simple instrument that superimposes a percussion sound on your finger-tapping. I like the idea of creating instruments that you interact with indirectly (in this case through the table).